Ground-fault circuit-interrupter (GFCI) outlets are safety devices that help protect you from electrical shock. They typically work reliably for many years, but they can fail and lose their primary safety function. GFCIs also can be wired improperly, disabling the safety feature of the outlet. That's why all GFCI outlets are equipped with buttons for testing their safety function. The test takes just a few seconds and doesn't require shutting off the circuit power. If a GFCI fails this simple test, replace the outlet as soon as possible. Look at the face of a quality GFCI outlet: between the two sets of slots where you plug in cords there are two rectangular buttons, labeled "TEST" and "RESET." To test your GFCI, simply press the test button with your finger. You will hear a snap sound that trips the outlet and cuts off the power to the two plug connections. To confirm that the power is off, plug a lamp or radio into each half of the outlet; the lamp or radio should not turn on. Alternatively, you can check for the presence of voltage with a voltage tester or a multimeter; this test also should indicate no power. Once you've confirmed that the safety function is working properly, press the reset button to restore power to the outlet. Another way to test a GFCI outlet is to use a GFCI outlet tester. This is a simple electrical device that has three LED lights to indicate various test results. 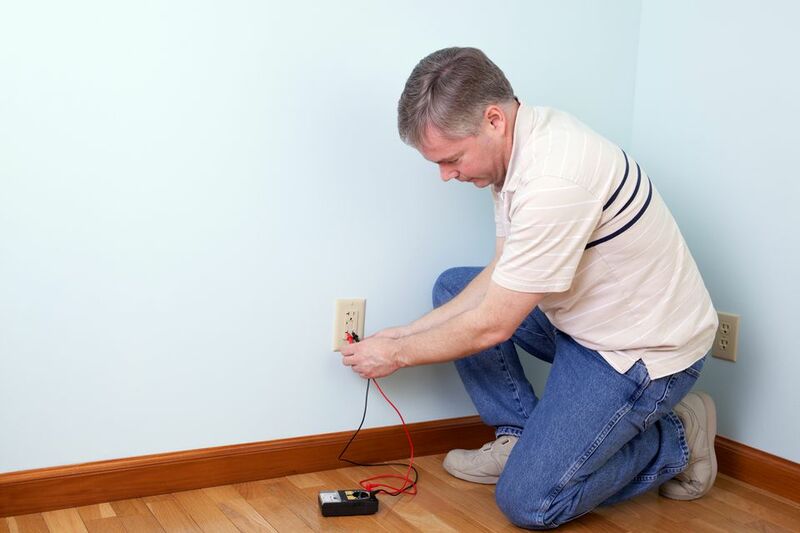 The tester can tell you whether the outlet is wired correctly and can also identify several wiring problems, including open ground, reversed polarity, an open hot or neutral, and a reversed hot and ground. The tester also has a test button that trips the GFCI to check the safety function; this has the same result as pushing the test button on the outlet face. A GFCI outlet tester is inexpensive and can test standard (non-GFCI) outlets as well as GFCIs, making it a handy tool to have in your electrical tool kit. Electrical safety experts and device manufacturers recommend testing GFCI outlets once a month. This may seem unnecessarily frequent, but the safety function of GFCIs can fail anytime and without notice, so there's often no indication of a problem. In many cases, a GFCI will continue to provide power to plugged-in devices even if the GFCI safety device has failed. Therefore, it's best to test them regularly to increase the chance of identifying a problem before a shock hazard takes place. GFCI protection can be provided by circuit breakers in addition to outlets. When a GFCI circuit breaker is used, it provides GFCI protection to all of the wiring and devices on the entire circuit. By contrast, a GFCI outlet may be wired to protect only itself, or it can be wired to protect itself and all other devices downstream on the same circuit. It cannot protect any devices upstream‚ or between the outlet and the power source feeding the outlet. GFCI circuit breakers also should be tested monthly. The test is similar to testing GFCI outlets. You simply open the door on your home's service panel (breaker box) and press the test button on the GFCI breaker. This should cause the breaker to trip, shutting off all power to the entire circuit. To reset the breaker and restore power to the circuit, flip the breaker handle off, then switch it on.